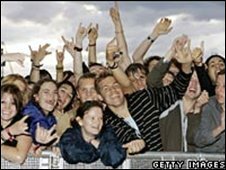 A new bridge built over the River Thames to carry Reading Festival fans was made with part of the stage used in Madonna's last world tour. In recent years, people using one of the camping areas at the Berkshire event have queued or taken a boat to and from the main site. Festival director, Melvin Benn, has overseen the £1m project. The bridge will be officially opened on Wednesday, two days ahead of the event. Staging infrastructure from Madonna's last world tour has been used to help build the 16ft (5m) wide structure - believed to be the first bridge to be built over the Thames since the Millennium Bridge near St Paul's Cathedral. Footings will remain in place all year round but the actual bridge will be taken down at the end of the festival and used again in the future. "This will be a real treat for festival-goers," Mr Benn said. "Getting from the north to the south of the site used to be slow and painstaking, but the bridge will make it a delight." The first fan to arrive at the site will join Mr Benn in cutting a ribbon to open the bridge on Wednesday. More than 75,000 fans are expected to attend the annual music event over the bank holiday weekend, boasting headline acts such as the Killers and Rage Against the Machine.